"★★★★½: an intensely realised, highly emotional experience"
Boundary-smashing German ensemble Schaubühne Berlin’s first collaboration with beloved Complicité director Simon McBurney, Beware of Pity, premiered at Sydney Festival last night to a full house and a rapturous response. 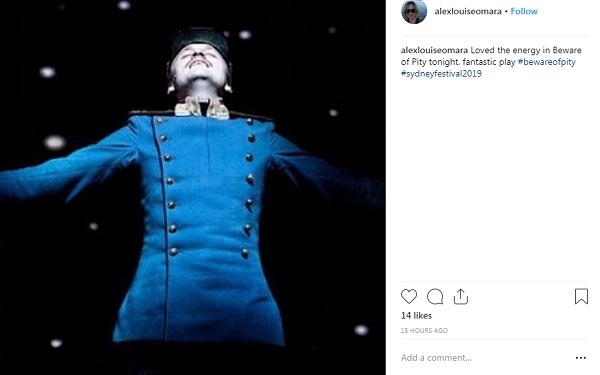 From the bold, spare staging to the superb acting, morally complex story and innovative use of video projection and live on-stage GoPro feeds, it was the type of affecting, adventurous performance rarely seen in Australian theatres. 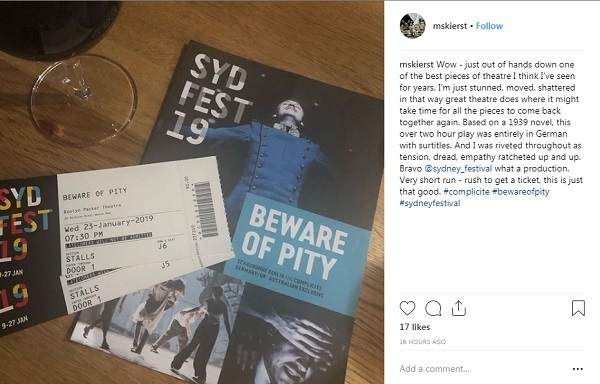 Read on below to see what reviewers and punters have been saying about Beware of Pity – there are still a few tickets left before the run ends on Sunday 27 January (grab your tickets here). “Stefan Zweig’s exquisite story of self-deceit and selfishness is brought to vivid life in this first-time co-production between two of Europe’s theatrical powerhouses: Berlin’s Schaubühne and London’s Complicité. “I haven’t experienced a more gripping adaptation of a novel to the stage since New York’s Elevator Repair Service brought Gatz (its unabridged staging of The Great Gatsby) to the Sydney Opera House a decade ago. "The acting is thrilling in its intensity and truth and mesmerising in its realisation of [director Simon] McBurney's trademark visual story-telling... Just as the words are made to float on the physical acting, so the music and sound (Pete Malkin​), video (Will Duke), set (Anna Fleischle​) and costumes (Holly Waddington) all submerge themselves beneath the dream-play surface. Extraordinary coups still occur, but never merely to amaze us. "Those familiar with Zweig's​ extraordinary book will be amazed at how McBurney and his ensemble – who collaboratively​ devised the script – have condensed 450 pages into two hours, yet preserved the characterisations, emotional impact, metaphorical implications and, above all, the relentless narrative drive." “Beware of Pity @sydney_festival: riveting, spelling binding, extraordinary. A total must see"
Beware of pity, a German play part of Sydney Festival, is yet another captivating performance. Well done!!! Loved BEWARE OF PITY: such a well-performed piece of theatre. Tight and precise, but never too cold for emotional impact. A fine way to end #sydfest.